Academic activities needs to be boost and students should be taught the practical aspect of each subject so that when they pass out and chair their respective clinics they don’t fuss out and feels lack in any respect with the fellow Allopath’s. Knowledge should be the key to every disease. It should not be such that they know only Homeopathic subjects as the base, Medicine part is very important in day-today life of a physician to cope up with the present scenario of the disease in medical science. Also it helps to keep an evidence of progress made in any disease condition with lab findings and so on. Also I would like to suggest if students are taught with practical classes from the very first year of their colleges / institutions with correlation of material, repertory and practice of medicine in such a way that the entire three subjects becomes one and potent, as it will be very helpful in becoming a successful Physician. Many thanks for your mail, and the interest expressed by you. I would like to mention here that the creation of the IHF, was primarily to focus on academics, with entirely practical approach. 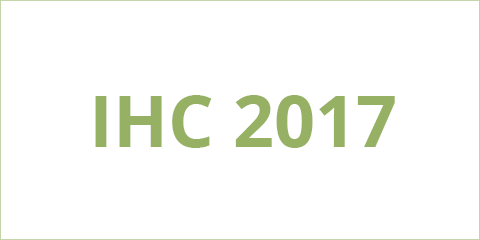 It is with this aspect keeping in view, that we were able to get very good speakers for the International Homoeopathic Congress, organized by IHF, in April, 2016. The main theme of the Congress was “EXPANDING THE HORIZONS OF HOMOEOPATHY”, and we focussed on the practical aspects, wherein the speakers were able to provide “Take Home” matter to help them in dealing with the cases in their clinics. I am in full agreement with your views expressed. You would appreciate that the initial 1-1/2years are important to understand the basics of medicine, which includes Anatomy, Physiology, Nursing etc., and then followed by the practical approach, along with compulsory attendance in OPD/IPD, and the emergencies. It is also important to teach them the actual interpretation of the rubrics, especially of Mind to help them individualize the case etc. 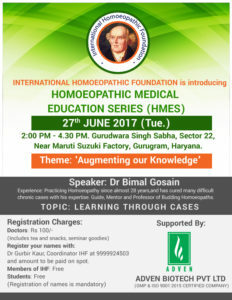 It is important that dedicated persons like you join this movement, and be a part of the International Homoeopathic Foundation, and take the initiative by also shouldering some responsibilities. Let us take a pledge in improving the academics in our institutions. Since July, 2014, the Government of India, has created the Ministry of AYUSH, to develop various systems of medicine (AYURVEDA, UNANI, SIDDHA, & HOMOEOPATHY). Now the ball is in our court to carry this mission forward.